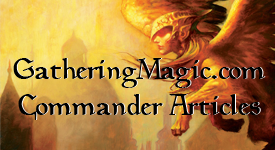 Most of you that voted in last post’s poll, want a EDHtastic set review of Worldwake. I guess you guys can’t get enough Magic reviews. Fine, fine, you’ll get your reviews after the Prerelease. As for now, you’ll get what I’m thinking about each new EDH General that’s officially released. The new General shouldn’t really be a surprise to anyone who’s been following Magic since M10. Vampires have been the New Kids on the Block being all high and mighty. They got a semi-awesome General in Zendikar, but of course Worldwake was going to bring the one who would lead the tribe (Anyone else notice how much tribal stuff they got going on in this block? Maybe it should’ve followed Lorywn instead of Alara). What follows is spoilers about this guy, so look away if you want to be surprised. Yes, he’s shirtless, but guess what, he’s not sparkling, and that’s a very good thing. Where's Blade when you need him? Jenna Helland introduced this guy in her Savor the Flavor article. Yes, Vampires get a new lord, and this one fits pretty well with the overall theme of the tribe. The Vampire tribe has been getting pushed the past several sets, though nothing completely EDH worthy to build around. Anowon’s a 4/3 for 3BB, so he’s really not all that aggressive. There’s no built in way to get damage to an opponent and when he enters the battlefield, the game state changes the same. He’s got one ability and it only goes off once per a turn, yours. All of these things sound so uninteresting; why anyone would get so excited about Anowon as a General? And suddenly, he’s got a big target on his forehead that matches his red line. But what’s so good about this guy is that his ability is untargeted; as long as you keep the battlefield clear of other creatures. Keep one thing in mind: it’s every every player, you and every other player at the table making him have a huge effect in multiplayer games. The easy thing to do would be to build a linear Vampires EDH deck and call it a day (if you want to do that, check out Bennie Smith’s list). Instead, I’m going the other way. Yes, I’m filling the deck with non-Vampires. But why? You’re killing your own creatures if you fill a deck like this. Really? I don’t think Grave Pact would mind, do you? Of course, when you sacrifice creatures, other cards that can take advantage of said sacrificing. There are plenty of cards here that allow you to gain life, so mix that with the new EDH staple Sanguine Bond, you can certainly hit them twice (which really is a nice tie into the theme). And anything that you would normally mix with Grave Pact, (token creators, sac outlets), would go great in this deck. But if you don’t want to want to go that way, I would suggest the following: play him as a control General. If he’s the only creature on your side of the table, he can’t sac himself (’cause he’s a Vampire). Equip him with Lightning Greeves and suddenly the only removal that could get rid of him is a Wrath or another sac effect. But he can get rid of your opponent’s Darksteel Colossus. Or whatever fattie is blocking your way. Play Damnation, then Anowon and suddenly your opponents have to play two creatures a turn to keep up. So just run him over and kill your opponents before they have a chance. Really, what could be more fun then that? Final Word: Of course, you could still make it a Vampire theme deck, and there’s nothing wrong with that. It makes sense that this guy would fit into a pretty linear deck (and an EDH deck at that). If you got a collection of Vampires that you want to use in an EDH deck, then I don’t see what you wouldn’t play him. Just expect some groans when you do reveal him at the beginning of your game, no matter if you’re playing Vampires or not. He’s going to be easier to get since he’s a rare, so he’s got that going for him, which is nice. Then there’s Conspiracy, if you really want to play Vampires. Pick him up, if you really like the blood suckers. I’m sure you’ll be seeing him around. This entry was posted on Wednesday, January 20th, 2010 at 1:20 am	and tagged with Anowon the Ruin Sage and posted in EDH, Magic: the Gathering, Worldwake. You can follow any responses to this entry through the RSS 2.0 feed. if you have anowon out and it becomes your turn, and you have no non vampire creatures to sac, is anowon buried? No, because it only says “non-Vampire” creatures. If you had 20 Vampires out, you wouldn’t have to sac a single one in this case.